Whether dining inside or out, entertaining in the Summer is always a popular time. To create a festive atmosphere for your guests, try one of these colorful tablescapes for summer entertaining. The colorful palettes and themed decor all work together to bring some pizzazz to your party. Because I love a pretty table, it was fun to come up with this creative collection of table decor. Take me to this party…please! It looks so inviting! I love all of the rustic touches. The flowers can be simply gathered from your yard and placed in a jar and then covered in a white paper bag that is tied off with twine or raffia. 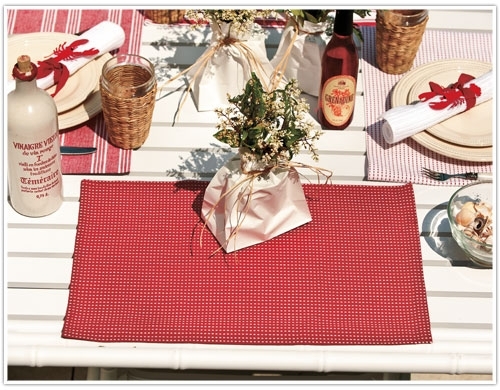 This red and white tablescape is warm and cheery. 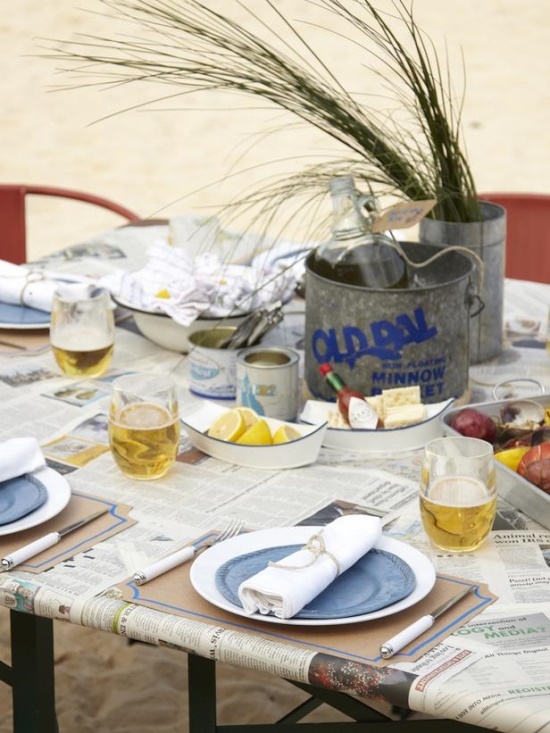 I might be on a lobster bake kick but I really like this next tablescape as well. It could also be used for a Summer fish fry. I am loving the minnow bucket used as an ice bucket! It’s also a great idea to simply use newspaper as a tablecloth. Not only is it cost effective and recyclable but it looks great especially as a back drop to the blue and white place settings. This more relaxed tablescape is sure to make your guests comfortable. 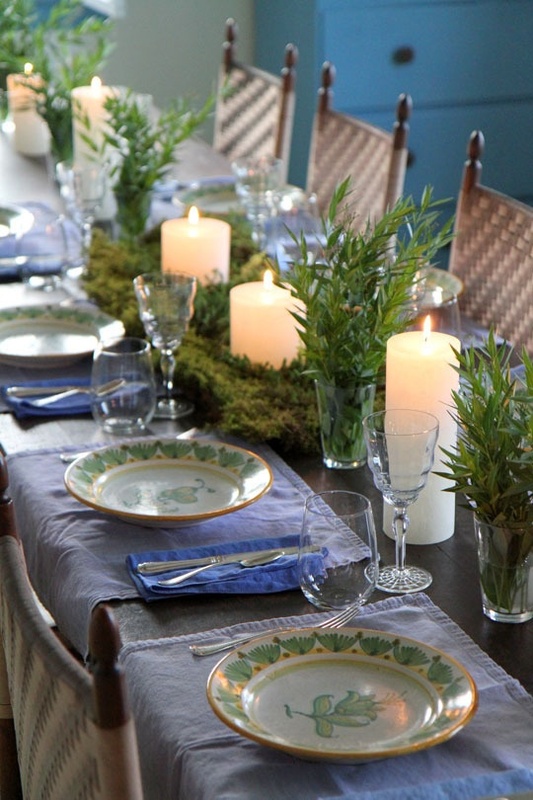 Here is a simple and fresh tablescape idea using moss and other greenery. A scattering of white candles completes the perfect look for Summer. 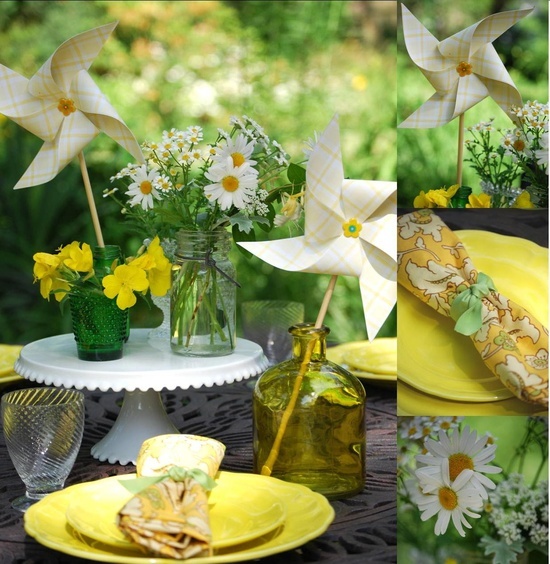 A collection of vintage bottles, daisies, and pinwheels……what else do you need for a bright and cheery table to entertain your guests? This combination will definitely draw the eye in. I have seen several different patriotic tablescapes but I particularly liked this one which was also a nautical or beachy theme. 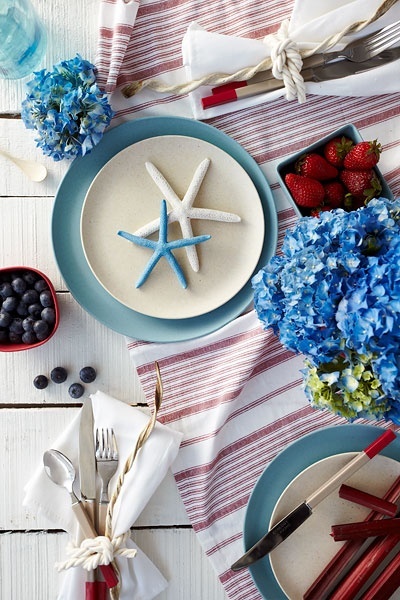 The colored starfish are a great way to signify the stars and I love the nautical rope tying the silverware together.